Create a Christmas sensory treasure basket for toddlers and preschoolers to explore textures, sights, sounds and scents of the season! 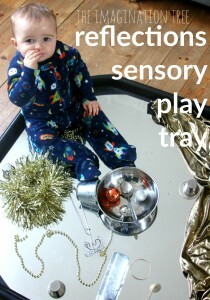 So simple and quick to put together, it will promote lots of curiosity and exploration using all of the senses. Over the years we have written lots about the value of simple, heuristic play for babies and toddlers, starting with creating Treasure Baskets of everyday objects for babies as young as 6 months+. Heurisitic play simply means “playing with real objects” and the benefits compared with engaging with noisy and brightly coloured plastic toys are extensive. You can read our archive of heuristic play posts here with some tips of good places to start and how to progress as your child develops. With Miss 2 growing up fast, it’s been a while since we put together a treasure basket for her. 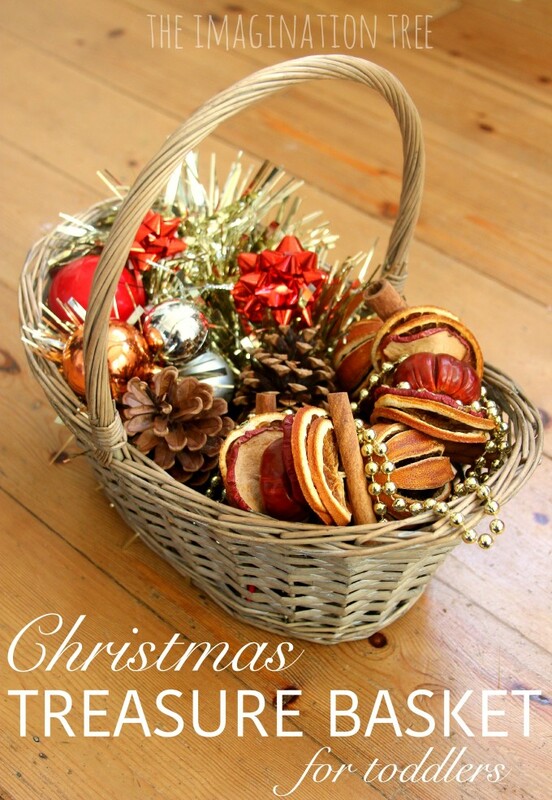 But with all of the wonderful sight, sounds and textures of the Christmas season it seemed such an easy opportunity to pop some new items into a basket for her to explore and experiment with. And being nearly 3 and NOT a mouther of small parts anymore (obviously bare this important factor in mind when choosing what to add to your own basket for your own child), it was fun to add some items that previously we might not have been able to. Miss 2 loved tipping everything out and discovering what was hidden in the bottom of the basket, then took more time to carefully handle each item and see how it felt to touch it and smell it. 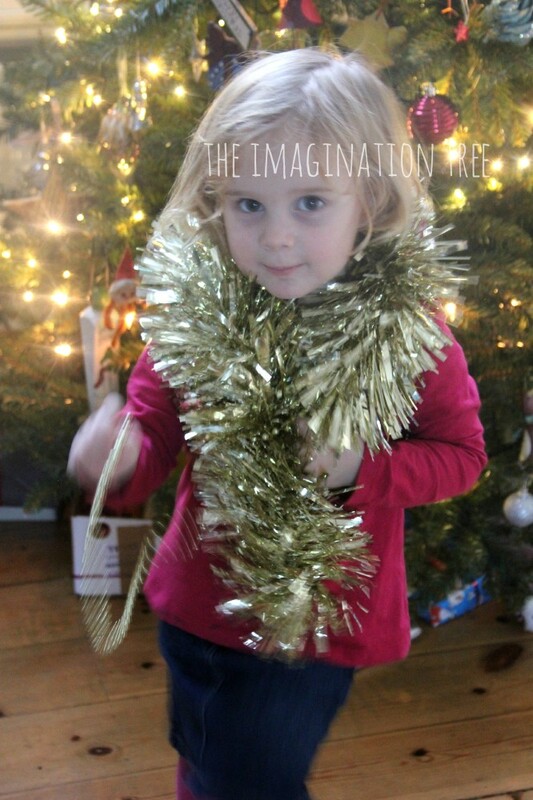 She was instantly drawn to the tinsel and wore it straight away like a feather boa around her neck, naturally! She stroked it often and I could see how much she enjoyed that sensation. 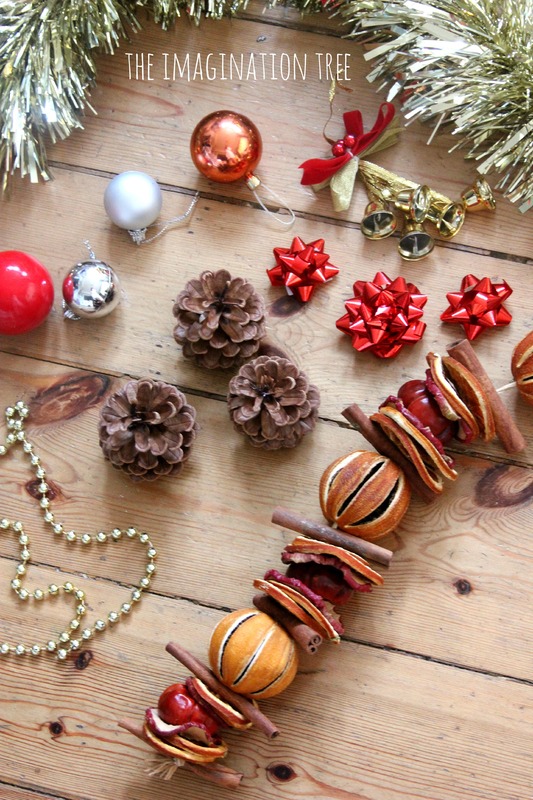 The golden bead string was a close second favourite object, with it being woven amongst the other objects, used to string the baubles up and taken around the house like a snake or a dog going for a walk. She returned often to the jingle bells and used them as a prop to sing and dance along with. The dried fruit string prompted a lot of questions and she was really interested in the way the fruit had shrivelled in some places. 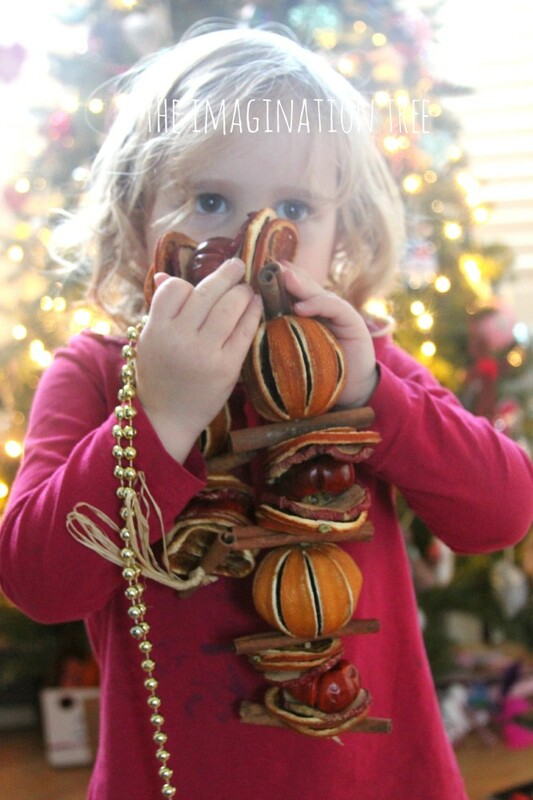 She enjoyed smelling it and again, using it as a decoration or an item of clothing to dress up with! 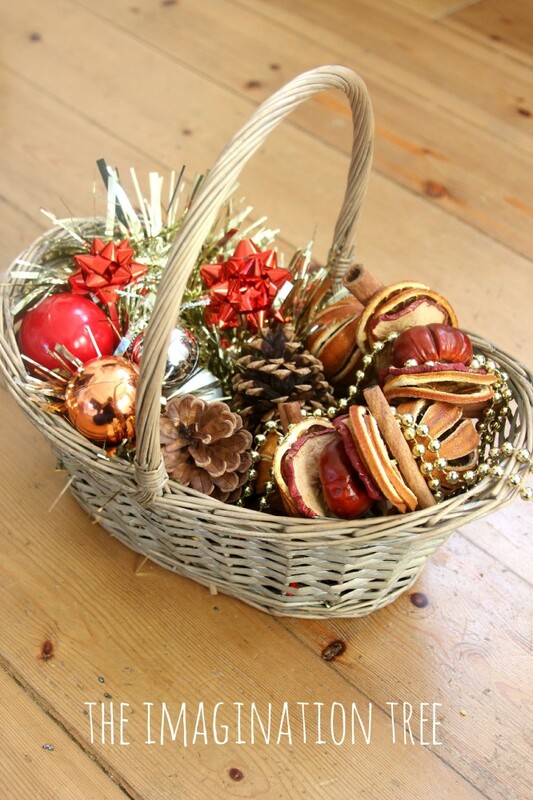 She also enjoyed packing the objects back into the basket and carrying it around with her, stopping to get some out occasionally before carefully returning them and making them fit together. So she was starting to try out some simple problem solving skills too. As always with this type of play, know your own child (or group of children in your setting) and be careful what you present them with if they are still mouthing small objects regularly. 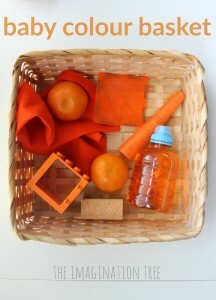 Treasure basket play is intended for open ended curiosity with no set purpose, and adults should become observers to play rather than instructors. Always keep a careful eye over how the objects are used and promote further questioning and investigating where appropriate. 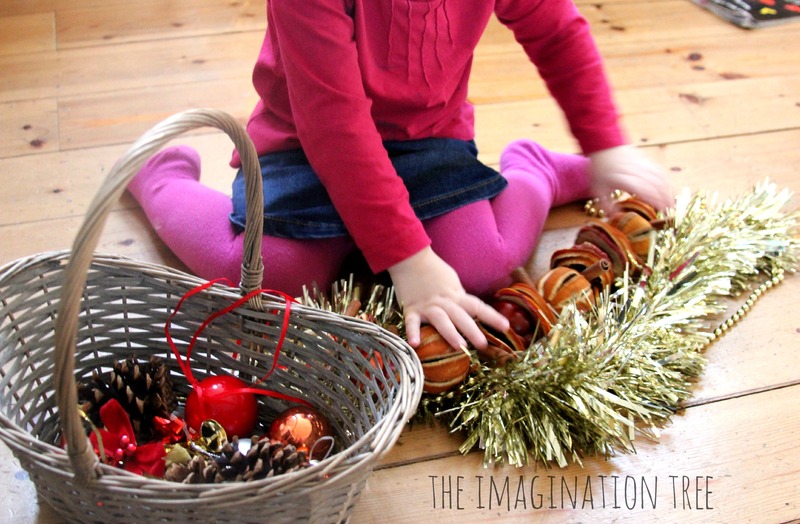 As usual, the older girls (ages 4 and 6) also loved this basket and played with it too when they discovered it, as part of imaginative play set ups and Christmas themed role play. All children love real objects for play! See our Heuristic Play archives here. 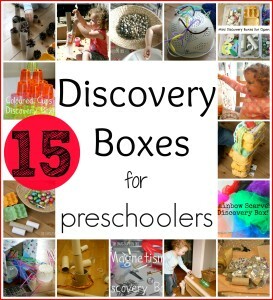 Enjoy ideas from our Toddler Play series here. 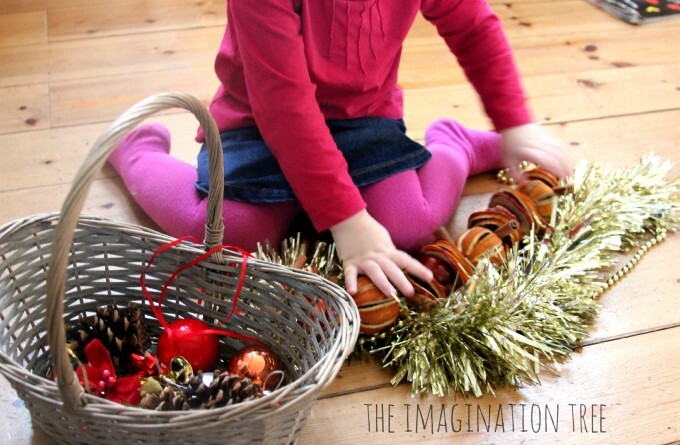 Follow The Imagination Tree on Pinterest for all the latest ideas from around the web! Follow Anna @ The Imagination Tree’s board The Imagination Tree: Creative Play and Learning for Kids! on Pinterest.